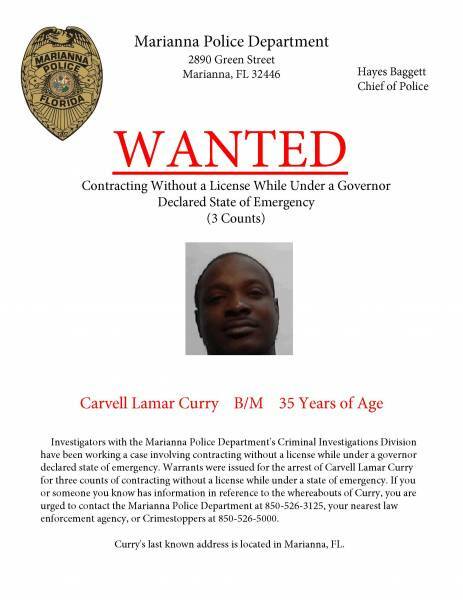 Wanted by Marianna Police Department :: RickeyStokesNews.com! During an investigation into illegal contracting in Marianna since Hurricane Michael, the Marianna Police Department received information that Total Package Environmental Services Inc. has been acting as a licensed contractor. Information gathered indicated Carvell Curry and Thomas Powell Jr. was operating under the business name of Total Package Environmental Services Inc. and performing roofing repairs and total roof replacements which require a contactors license in the State of Florida. During the investigation it was determined that no permits were obtained to perform the repairs and replacements. Curry and Powell were completing handwritten proposals or contracts and leading the homeowner to believe they were licensed contractors. Both subjects collected cash down payments from homeowners prior to beginning the repairs. On January 24th, 2019 warrants were obtained against Curry and Powell for three counts of contracting without a license while under a governor declared state of emergency. On January 24th, 2019 investigators located Powell at a job site on Fairfax Road in Marianna, Florida. Powell was arrested on the warrants and transported to the Jackson County Correctional Facility. As of the time of this release, Curry has yet to be apprehended. If you or someone you know has information into the whereabouts of Curry, you are urged to contact the Marianna Police Department at 850-526-3125, your local law enforcement agency, or to remain anonymous, Crimestoppers at 850-526-5000. In order for roofing work to be completed on your residence or business, the business and the individual must be a licensed contractor. The contractor then has to obtain a permit before the repairs or replacement can be performed. As a citizen, you can search the Florida Department of Business and Professional Regulations website where you can review contactor license in the State of Florida. This website also provides information on hiring a licensed contractor.